EVERGREEN CEMETERY (located on Aladdin Road north of Colville, Washington) has undergone significant changes in appearance and functionality. Brush has been removed from the fence line and low-hanging branches of the many pine trees on the grounds have been trimmed away. This to give the cemetery a more open look; both from the outside looking in, and from the inside looking out. In February 2009, NeWGS received a "Certificate of Authority for the Care and Maintenance of the Evergreen Cemetery" signed by the Washington State Historic Preservation Officer. We have been caring for this cemetery for over 30 years; we are now proud to have official recognition. A sign board has been erected near the entrance to give identity to the cemetery. Burials have been carefully indexed and then printed in alphabetical order, listing all known persons interred at the cemetery. The sign board has the listings of burials identified by block number location. Block locations have been identified with marker stakes strategically located on the cemetery grounds. A map of the plots at the cemetery is provided near the sign board; all this to make it easier to find your ancestors who are buried there. To assist cemetery visitors in finding burial locations, a grid system has been established for all grave markers on the grounds. Once the Block Number has been found on the alphabetical list of names found on the sign board, just turn around to face the cemetery grounds and observe the Map Board which will direct you to the location of your burial of interest. A link to a list of known burials at Evergreen Cemetery has been added to our web page. From the Home Page, click on Cemetery Records. A search box is provided for you to enter the name associated with a burial at the cemetery. When you find the person you are looking for, click on the eyeball to view information regarding the burial. You will be able to print the viewed information. Membership in NeWGS is not required for this service. Evergreen Cemetery was established in 1868. It is a "natural cemetery"; there is no water or electricity supply. There are over 600 graves in the cemetery. This pioneer cemetery is the burial place of soldiers who fought in the Indian Wars, Civil War, Spanish-American War, World War I, World War II and Korean War. The cemetery is also the final resting place for many homesteaders and early pioneers of the Stevens County area. Evergreen Cemetery is open to the public year-round for descendants to locate their ancestors. You are encouraged to come and visit. Care and maintenance of the cemetery is provided by volunteer members of the Northeast Washington Genealogical Society. A special fund has been created at Banner Bank in Colville to help with upkeep and maintenance costs at the cemetery. Donations can be made by making your check payable to Evergreen Restoration Fund and mailing to NeWGS, c/o Colville Public Library, 195 S. Oak, Colville, WA 99114. Donations can also be made using PayPal. 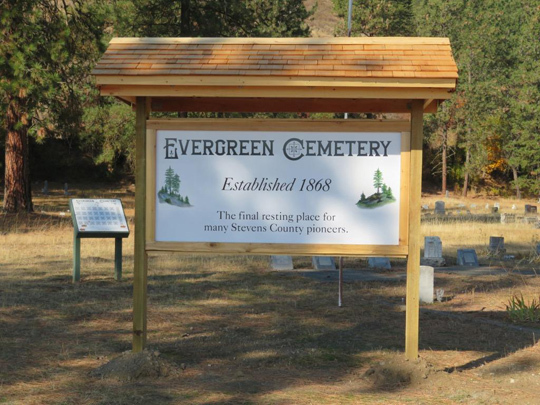 If you have comments, requests, or questions regarding Evergreen Cemetery, please contact Lora Rose at (509) 684-5690.